It’s 16:02pm and I’ve been training in the gym of the Ritz Carlton hotel in Berlin. A man in a suit approaches me and says: “Barack Obama is about to come and train …“ Shortly after half past four and he actually arrives! Barack Obama is wearing a grey t-shirt, black tracksuit bottoms – and a great smile! Obama (with toned arms and a strong back) puts on his headphones for his iPod to listen to pop music. He hums quietly. Then he jumps on a fitness bike. He pushes three times on the pedals – but then can’t be bothered with it. He goes and picks up a pair of 16 kilo weights and starts curling them with his left and right arms, 30 repetitions on each side. Then, amazingly, he picks up the 32 kilo weights! Very slowly he lifts them, first 10 curls with his right, then 10 with his left. He breathes deeply in and out and takes a sip of water from his 0,5 litre Evian bottle. Shortly before five o’clock Obama comes over and sits directly next to my cross-trainer on the mat. First he does 10 sit-ups, then stretches. Then he looks at his watch and says to his bodyguard: “It’s time, let’s go.” Quickly I ask: “Mr. Obama, could I take a photo?”. “Of course!” he answers, before asking my name and coming over to stand next to me. “My name’s Judith” I reply. “I’m Barack Obama, nice to meet you!” he says, and puts his arm across my shoulder. I put my arm around his hip – wow, he didn’t even sweat! WHAT A MAN! My goodness! The infatuation with Obama is insane. Honestly, this reads like a satirical article in The Onion. The phrases, “Obama (with toned arms and a strong back)” and “He breathes deeply in and out and takes a sip of water from his 0,5 litre Evian bottle” sound extremely contrived. What’s more, I think the Bild reporter was German. I’m glad the Germans approve. This entry was posted in Funny, General, Politics and tagged Funny, obama, Politics on August 20, 2008 by Scott. The effect is enormous. Betsy’s marginal tax rate goes up from an already ridiculous 42.5% to 51.4%—not including the new 6.2% marginal tax on your employer. Subject to how she structures her withholding, Betsy’s take home pay drops an average of $515 a paycheck—less in the early months of the year, but much more in the later months of the year. Add in the effects on her bonus, and Betsy loses nearly $20,000/year in take-home pay. I added a third column: how big a pay cut would you have to take to receive the same take-home income? 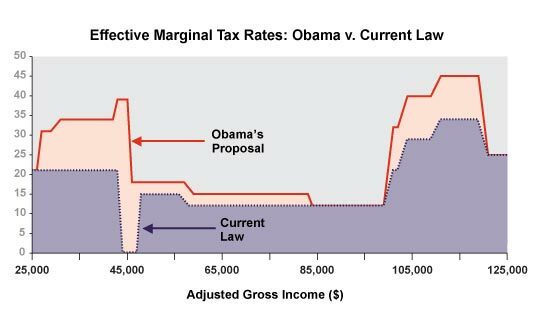 The answer is that Obama’s tax increases have a bigger effect on your income than a law firm cutting New York salaries by $34,000. Here’s something interesting. National defense spending (including the wars in Iraq and Afghanistan) as a percentage of the GDP is actually 1.5 percentage points below the 45-year historical average. This entry was posted in General, Politics and tagged McCain, obama, Politics, taxes on March 31, 2008 by Scott.